This is the third of a series of posts on the Christmas story in the gospels. The first one concerned Matthew’s account, and the second concerned Mark’s account. I'll divide consideration of the story in Luke into two parts. The gospel of Luke is our other nativity story. Or rather it is what we consider the real deal: it is the one that most captures our imagination. It is the one with the inn, the stable, the manger, the animals and the shepherds. It is the version most often read on Christmas Eve both at church and at home to children. It is the account that provides the frame for our smooshed together nativity story. We simply add in the wise men from Matthew as if Luke, in the excitement, had forgotten about the wise men that we read about in Matthew. Matthew’s account and Luke’s account are really quite different. They don’t deserve to be blended. Both focus on a virgin birth, but the differences are much more striking. 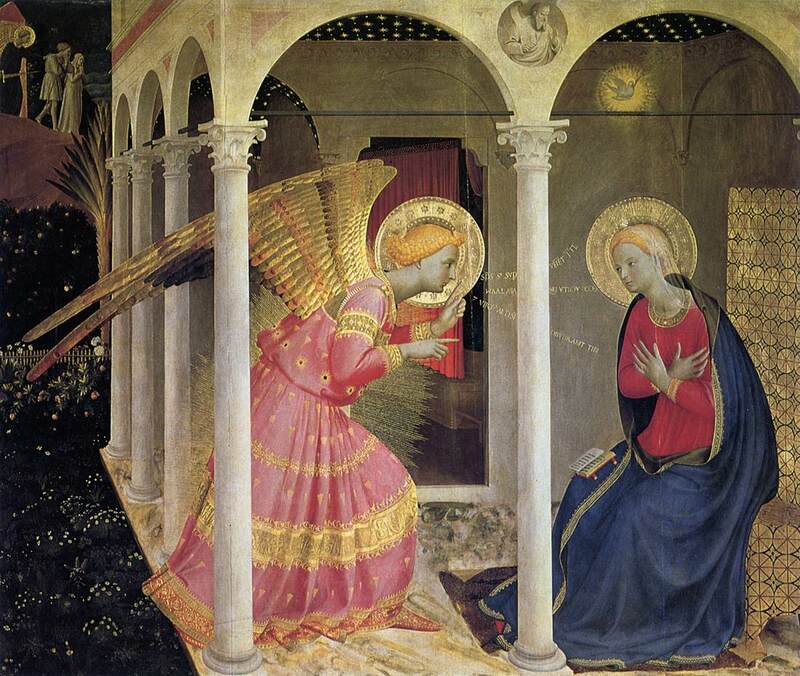 In Luke, the Angel Gabriel appears not to Joseph but to Mary, who reacts at first with dismay, but then hears “Do not be afraid, Mary, for you have found favor with God. And behold you will conceive in your womb and bear a son, and he shall be called Jesus” (1:30-31). Moreover, there is double the miracle, because six months before, Luke tells us, the Angel Gabriel had appeared to the priest Zechariah, telling him that he and his wife Elizabeth (a kinswoman of Mary) would conceive a child that they should name John, even though both were childless and well advanced in years. Zechariah was not just dismayed but doubtful of this news, so Gabriel made Zechariah mute “until the day that these things come to pass” (1:20). When Elizabeth’s baby is born, she is urged to call him Zechariah after his father, but she surprises everyone by saying the baby should be named John. And so mute Zechariah is asked his preference, and when he writes “John” on a tablet, his gift of speech is restored. “And they all marveled” (1:63): the miracles (seen by many) begin well before Jesus is born. In Luke’s narrative about Gabriel appearing first to Zechariah and then to Mary announcing the two miracle births, there is also an account of a meeting between Mary and Elizabeth. When Mary enters Elizabeth’s house, Elizabeth’s baby “leaped in her womb,” Elizabeth says to Mary “Blessed are you among women, and blessed is the fruit of your womb” (1:42). Mary, for her part, utters a marvelous prayer of joy and thanksgiving, which begins “My soul magnifies the Lord, and my spirit rejoices in God my Savior” (1:46-47). Is there a longer or more beautiful prayer by a woman anywhere in the Bible? This part of the narrative ends with a lovely prayer by Zechariah praising God for fulfilling various prophecies and promises (1:68-79). Chapter 1 in Luke's account is taken up with the angel Gabriel's appearance first to Elizabeth and then to Mary, then with the visit of Mary to Elizabeth, and finally with the birth of John. We tend to jump over this part of the narrative to get more quickly to the birth of Jesus, but a great deal of important foundation is laid here. Among other things, Luke's version connects up the Nativity story to the later baptism of Christ by John by having John's birth be part of the Nativity story. What especially strikes me about Luke’s account is how much more the Nativity story focuses upon women in his telling, and yet how little we lift that up when we tell Luke’s story in our own ways. For all the confusion(and outrage?) over Roman Catholicism's veneration of St. Mary Major, Luke offers us the mother of Jesus as he offers us Primitive Christianity(in "Acts of the Apostles") - as idealized role model. I presume it's our roots in Protestantism that have dissuaded us from embracing Mary as whole-heartedly as the Early Church. Still, I would have expected Luke's original-deference to Mary being part of John's Gospel, since that disciple was entrusted by Jesus as Mary's son (if we can believe the crucifixion story). Could this shortchanging of women's role in Salvation History somehow be characteristic of Jewish evangelists - much as the Greek creation story has a Mother goddess dancing over the waters? It would be more like an originally inclusive treatment of women getting progressively de-emphasized and then reversed as the Church spread more and more into a culture which basically disapproved of and distrusted women, which thought power & authority belonged to men. Paul didn't write the bit about women not speaking in church, but "Paul" (whoever was editing &/or copying his stuff later) thought it was the sort of common sense thing he'd intended to say. The way I'm reading this... Mary was following a 'leading' where circumstances went very badly for her, but she kept a sense -- experienced by Joseph in 'Matthew' -- that this was all part of something God intended to put to use. Anthony Bloom, speaking from a Russian Orthodox tradition, ascribes Jesus' first miracle to Mary. You remember how in Mark, Jesus wasn't able to do miracles in his home town because people who'd known him as 'Mary's kid' had no faith in him. In John's story (where Jesus borrows his first miracle from a legend about Bacchus, but this one seems intended to say more) Mary starts off telling Jesus that there isn't enough wine left at this wedding, and Jesus responds quite rudely. Bloom says he's reminding her ("What have I got to do with you, woman?") of what she experienced in the course of his birth, hinting that she needs to have faith in what that meant. At this point, she tells the servants to "do whatever he tells you to do." That is, she's taken herself out of the loop and put Jesus in charge, making the miracle in the story possible. Or, Mary was simply being the Jewish mother, or "If mama ain't happy...", or women have the real power/influence that men resist/begrudge until they get hungry(or thirsty?) or horny enough? !